Mediators have power. 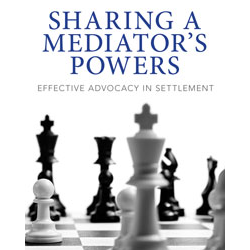 This book teaches lawyers how to advocate effectively for clients in mediation by utilizing the powers of mediators. Using examples from actual mediations, this book explains how advocates can harness these techniques to maximize effectiveness in bargaining. Thisessentialbook covers many important facets of mediating effectively – from learning how to build a foundation for success, influencing the bargaining, developing an advocacy plan, and key steps in between. Part I describes a basic strategy used by many commercial mediators. Part II analyzes how lawyers can take advantage of a mediator’s special abilities. Part III explores the techniques most effective at particular stages of mediation.